The website of ACIN, the Association of Indigenous Councils of Northern Cauca, has been shut down, limiting their ability to communicate to the world about on-going clashes with special forces police in the area. There are reports of several wounded indigenous activists in La Maria, where the communities have been mobilized since Sunday, as well as reports of two deaths. Activists are asking people to contact the Colombia government representatives to protest this censorship. For the present, information can be obtained at the CRIC web site: http://www.cric-colombia.org Nos han bloqueado www.nasaacin.org . Por favor sigan insistiendo y exijan que el Estado colombiano respete el derecho a la comunicación. Estamos subiendo la información que podemos a la página del CRIC www.cric-colombia.org. Por favor publiquen y reenvíen todo lo que reciban de nosotros para que no nos silencien, mientras nos masacran. Tejido de Comunicación y Relaciones Externas para la Verdad y la Vida Asociación de Cabildos Indígenas del Norte del Cauca - ACIN Telefax: 0928 - 290958 - 293999 Email: acincauca@yahoo.es Web: www.nasaacin.org Santander de Quilichao Cauca -Colombia From Mario Murillo: As I write this, over 12,000 indigenous activists and representatives of other popular and social sectors of southern Colombia are urgently congregating in the “Territory of Peace and Coexistence” in La Maria Piendamó, in Cauca, confronting a massive presence of state security forces who have been ordered to dislodge them. The popular mobilization began on October 12th, and was called to protest the militarization of their territories, the US-Colombia Free Trade Agreement, and the failure of the government of President Alvaro Uribe to fulfill various accords with the indigenous communities relating to land, education, and health. 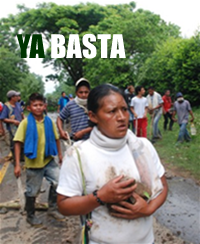 On Monday, as expected, the communities participating in the indigenous protest blocked a portion of the Pan American Highway that connects the cities of Popayán and Santander de Quilichao, in the department of Cauca, in an act of civil disobedience meant to force the government to meet with them to discuss some of their demands. Instead, what we’ve seen over the last two days are serious confrontations between special-forces police units and the communities assembled, with several indigenous activists severely wounded, one possibly fatally, in the ensuing clashes. These unfolding developments come just days after two other Nasa Indians – Nicolás Valencia Lemus and Celestino Rivera - were assassinated by unidentified gunmen late Saturday night and into Sunday morning, a few hours before the start of the mobilization, bringing the total number of indigenous activists killed in the last three weeks throughout Colombia to 11.